Many natural health enthusiasts know that salt is one of the best non-toxic cleaners out there, and it’s a great food preservative as well. But there are a number of ways you can use salt to clean your home that you probably didn’t know about. Here are 18 of them. Pour salt mixed with hot water down a kitchen sink drain to break up any gunk and keep grease from building up. 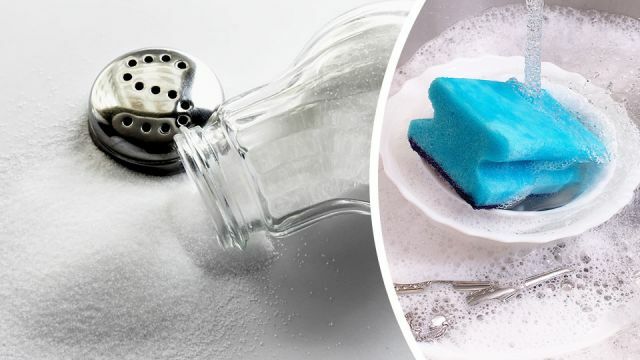 Salt makes a great scrub when mixed with dish soap and can be used to remove stubborn coffee stains. Make a paste from equal parts of salt, flour and vinegar. Leave it on brass or copper for an hour, then clean and wipe off with a soft cloth. A little like rice, salt can be used to soak up tricky spills: clean up as much as you can with a normal cloth, then sprinkle salt over the remaining bit and give it time to drag out the last traces of wine. Soak and rinse in cold water, then wash as normal. This can work on tablecloths, clothing and even carpets. Apply a salt water mix (a few spoons in a quarter glass of water) to underarm stains on t-shirts, give it a bit of a rub, then put it in the washing machine as normal. The stain will be very much reduced, though still slightly noticeable. You can use salt washes to brighten clothing and sheet colors, and also to set non-colorfast dyes. For the latter, soak the material for an hour in half a gallon of water with half a cup of vinegar and half a cup of salt. Ants avoid walking on salt, so sprinkle it around the vulnerable cracks in your home where they tend to sneak in. Add a dash of salt to the water in your flower vase to help keep flowers alive longer. Salt water is great for oral hygiene — from sore throats to the site of a recently removed tooth to basic teeth cleaning. Use fine salt mixed with two parts baking soda for perfectly good toothpaste, or add some water to wash orthodontic appliances. If a hot dish or some water has stained a wooden table or something similar, git rid of it using a salt and olive oil paste. Apply, rub a little, wait an hour, then wipe off with a cloth. Throw a handful of salt into your fireplace to help loosen some of the soot, and produce a lovely yellow flame to boot. A lemon dipped in salt and rubbed over a wooden cutting board will bring back some of its brightness and give it a penetrating clean. Prevent weeds from growing in pavement cracks or other areas by sprinkling salt there. After using kitchen sponges, drop them in salt water to help them last longer and stay clean for the next use. Eliminate moisture and bad odors from shoes by spraying their insides with some salt water. Use salt water to rinse out plastic or glass containers that have a strong smell in them, then rinse as usual with detergent. For yellow bath or sink stains, mix salt and turpentine, then leave it for 15 minutes. This mixture will turn your bathroom surfaces white again. Mix half a cup of salt with a bucket of warm water and use that to mop tiles — you’ll clean them, and prevent them from getting dirty so quickly next time. Salt is incredibly versatile! We haven’t even covered its health benefits here! Do you have any secret, special ways you use it? Let us know in the comments.